This is now one of our scarcest passerine birds, with probably fewer than ten pairs breeding in Cheshire. Their county population has crashed, going from 82 occupied tetrads in our First Atlas to just 13 now: the only areas where Tree Pipits are normally found are the foothills of the Pennines, and Risley Moss. The contraction in Cheshire distribution reflects the species’ national decline. BTO CBC data show that their population peaked in 1985, and had dropped by 84% to 2005. The reduction in Cheshire was well under way by the time of the national atlas in 1988-91, when Tree Pipit was lost from as many as ten 10km squares that had been occupied in the 1968-72 atlas. The core of their British range is the Western Atlantic oakwoods – sometimes dubbed ‘Britain’s Rainforests’ – which have a unique community of birds, especially the migrants Tree Pipit, Wood Warbler, Redstart and Pied Flycatcher, all of which are in decline. These areas were not well surveyed by the CBC, and the uncertainty caused by the sparse coverage means that Tree Pipit is only placed on the amber list of species of conservation concern, whilst it deserves to be on the red list. The ‘repeat woodland bird survey’, in which BTO and RSPB staff re-visited in 2003/04 hundreds of woods that had been surveyed twenty years before, also showed drops of 70-85% in Tree Pipit numbers (Amar et al 2006). The reasons for their population decline are unknown, but have been suggested to be linked to changing forest structure, as new plantations mature, and reduced management of lowland woods (Fuller et al. 2005). This explanation does not fit the managed plantations of Delamere Forest, where they used to be found in the early-growth stages but are not there now, even though apparently suitable habitat is readily available. 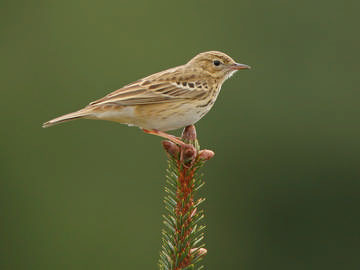 In similar areas of commercial Scots Pine and Corsican Pine in Thetford Forest, Norfolk, Tree Pipits reach a maximum density when newly-planted pines are 1 to 6 years old. Birds crowd in, with a minimum territory size of 1 ha in 5-year-old stock, but the area is unsuitable for them by the time that the trees are 10-12 years of age. Densities are much higher in the main parts of the forest than in surrounding patches of woodland. The species is limited by the availability of songposts and the best areas have at least one tall tree left amidst the clear-felled sections (Burton 2007). As with many of the migrant bird populations that are in decline, perhaps the causes lie outside Britain, on migration or in the African wintering grounds (Sanderson et al 2006). Tree Pipits winter in forest and wooded savannah from Guinea in west Africa as far as South Africa, but the whereabouts of British birds is unknown. The present state of near-extinction in Cheshire was not mirrored in the local atlases of Lancashire and North Merseyside (1997-2000) or Cumbria (1997-2001), perhaps for three reasons: they had no previous tetrad survey with which to compare; contractions in range are usually more obvious where a species is at the edge of its distribution; and, probably most importantly, Tree Pipit in Britain is becoming mostly an upland species and the edges of the Pennines and Lakeland provide many more opportunities for them to breed. As their name suggests, they need trees, but only at low densities. Sparse upland sessile oakwoods are ideal, but the analysis of BTO nest record cards (Rose 1982) and the work of Simms (1992) showed them using an eclectic range of habitats, including grass/ heather moorland, grassland, heath and wasteland including old quarries. In this survey the few Tree Pipits found were reported from a wide variety of habitats in woodland, scrub, semi-natural grassland, heath and farmland. They are often said to be amongst our earlier migrants, with the first arrival in Cheshire and Wirral typically in the first week of April, but this is a misleading statistic as most birds come much later and they are one of the latest to breed, with first-egg dates in mid-May. In this survey there were only two tetrads with proven breeding, both from observers seeing adults carrying insects back to their young, and most records were of birds performing their conspicuous parachuting song-flight.